The Hard Rock Hotel and Casino in Las Vegas offers fine dining, great music and fascinating musical history. A trip to Las Vegas for many symbolizes casinos and gambling, dinner and shows, lounging by pools and great shopping. For the most part, that’s not far off. However, if you want to experience fascinating rock and roll history and outstanding live music, as well as some fine dining and drinking, then a visit to the Hard Rock Hotel and Casino is a must. The concert venue at the Hard Rock in Vegas hosts performances that range from iconic groups such as ‘80s pop legend Duran Duran, Incubus and The Killers to thumping club music by DJ Tiesto. Recording the history of rock through memorabilia since the opening of the first Hard Rock Cafe in Los Angeles nearly 30 years ago, is Warwick Stone, Memorabilia Curator and Art & Theme Consultant, whose workshop is located in a former suite in the original tower of Hard Rock Vegas. During a visit a few months ago, a caped Elvis costume was standing in the corner of his workshop, ready for a cleaning. A Britney Spears short, cheerleader costume stood on a table. During a personal tour, Stone talked about how he obtains and negotiates for the memorabilia that fill glass cases and frames throughout the hotel and casino. Stone said first and foremost an item must come with a story–something that verifies the wearer of the costume and where they performed in it. A photo, journal note, letter or something that gives all this is what he looks for. He carefully packages any items that tell the story in frames and cases. Taking a group through the casino, Stone relayed such details as who made certain costumes, and the back-story behind the costumes before a certain star wore it. The story behind a Michael Jackson white, sequined glove on display in the lobby of the HRH All-Suite Tower that Stone told was of how the singer had gone to a premiere of a movie he made that received poor reaction, except for a man who was a fan and who applauded at the end. Jackson threw the man his glove as he was walking out of the theater. That person was a collector/dealer. Stone also told the story of when he was putting together the display at the hotel’s main entrance of The Killers costumes on skeletons. The band members thought the skeletons were too skinny, so they asked him to pad them. Stone subsequently padded the skeletons several times to the point that the heads look much smaller than the bodies, but the The Killers were happy with the result. In keeping with the times, most displays have QR codes that visitors can scan to get the whole story on each one. Nirvana and heavy metal band Avenged Sevenfold are the two most popular displays based on the number of hits. Make sure to schedule at least a full day to take in all the displays. Reliquary Water Sanctuary & Spa inside Hard Rock Hotel & Casino offers a variety of treatment options, including the Ancient Cane Ritual. you want-and music, of course-the Rehab pool may be a relaxing spot for some (if you like super loud, thumping club music while you drink your cocktails). Once a super hot party spot that got in trouble for illegal drugs two years ago, screeners now check all bags for any type of illegal paraphernalia. The party is still going on there, but safe and saner now. For dining at Hard Rock, 35 Steaks and Martinis, which is its newest gourmet food venue, is a must, no matter where you stay in Vegas. First, you’ve got the most creative mixed martinis around, such as the Spicy Signature Serrano Martini. Fresh sliced serrano peppers float in an icy mix of vodka and a lightly muddled hot pepper mix , giving a nice bite to your evening. Or there’s the 35 Gimlet, a mix of vodka, gin, lime juice and the added freshness of cucumber slices. The Hard Rock Hotel and Casino in Las Vegas offers not only great concerts and a fascinating look at rock history, but now with its newly opened 35 Steaks and Martinis, also fine dining. The food is just as good as the drinks. Appetizers like the delicate Crab Cake, made with the lump blue crab, Thai spice, red curry cream, and served with mango salad, or the charcuterie of thinly sliced salami and house made pickles are a delicious way to start the evening. For entrees, whether you go with seafood, such as the Seared Day Boat Scallops, which were the most perfectly cooked scallops I’ve ever eaten, or meat, of which there is a delightful choice, from Porterhouse, Prime Rib and Filet Mignon to the Tomahawk Chop (Long Bone Ribeye for two), you can’t go wrong. Everything at this restaurant is top-notch. There is also a Pink Taco, Nobu and Johnny Smalls (which serves a menu from around the world it seems. Get a chili dog, beef sliders, sushi or asada tacos, they seem to have it all). As for accommodations, the HRH All-Suite Tower rooms are luxurious and super modern–decorated in tones of white, grey and black, with large wall art featuring, what else but icons of rock and roll. More information on the Hard Rock Hotel and Casino, Las Vegas, can be obtained at www.hardrockhotel.com. The HRH All Suites Tower are sleekly modern, offering the ultimate in amenities. “Welcome to Paradise,” said the manager. This was in the midst of a “Twilight Zone” experience of trying to check in at the La Quinta Resort and Club in the desert, though, not due to the fault of the staff at the resort. Gracious and accommodating they were, despite the fact my name could not be found on the reservations list, or anywhere else for that matter. I waited as staff members flurried back and forth, trying to solve the mystery as to why my planned visit of one night at the famous hideaway resort and club, with some of the best golf courses in the world, was not listed anywhere. I was offered a refreshment, “A glass of wine, perhaps?” which seems to be the customary welcome to guests checking in. At first I said no thank you, and again no thank you after a second offer of a drink, though I did say, “I might need one soon,” when the staff did not recognize the name of a person I was told would be my contact at the resort. I finally did say yes when I was told the restaurant where I had dinner booked did not exist at the resort, or anywhere in the town of La Quinta. As I sat in the rustic, yet plush, comfortable 85-year-old Santa Rosa Lounge, sipping my chardonnay, the manager at the time said even though there was no record of me at all at the hotel, I would be staying in a casita–with a private patio and spa. I cannot say enough about how gracious the staff at La Quinta is. They are trained to make each and every guest feel as if they are the most important person they have visiting the club. And with absolute sincerity. An employee on a gas-powered cart led me to parking near my casita, then to my room, where the bellboy showed me how to work the spa and the fireplace in the spacious room with a firm, king-sized bed. The bathroom itself had a “king-sized” bathtub, with a glass-enclosed shower next to it and a double-sink counter. It was 4:30 p.m. by the time I collapsed on the bed. As I contemplated the mystery of my Twilight Zone nonexistence (my stay was set up by a third party-I found out later I was mistakenly booked at a different hotel), I decided the best way to relax after a 3-and-a-half hour drive from Los Angeles (the drive normally takes 2-and-a-half hours max. ), was to jump in the perfectly temperature-set spa with jets. So private is the patio and casita, I could have jettisoned my bathing suit-but, just in case, I kept in on. The surrounding jagged, rocky Santa Rosa Mountains, which were outlined by a deep, cornflower blue sky, could be seen from my little corner of paradise. And when dark falls, the stars fill the sky. 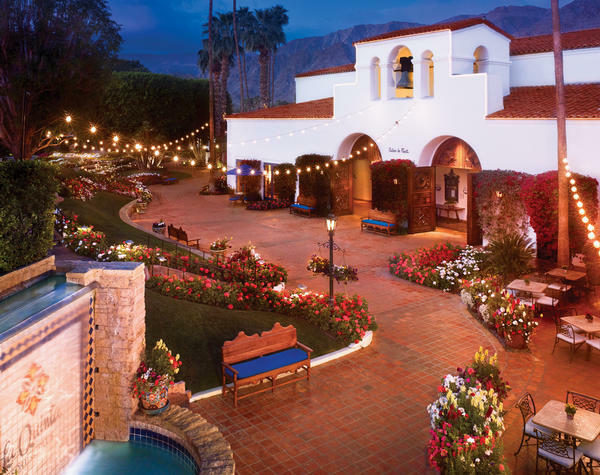 Walter H. Morgan, who came to the desert in 1921 for health reasons, built the La Quinta Resort and Club, originally called the La Quinta Hotel. It was a self-contained, secluded hideaway for celebrities, high-profile politicos and society leaders-a place where the rich and famous could romp and relax away from prying eyes. It is located about 20 miles past Palm Springs, off the I-10. So many famous people have stayed here it would be impossible to say who was the most noted guest. On the literary (and showbiz) side-Frank Capra stayed in one of the original 20 casitas. It is said he penned “It Happened One Night” in Casita No. 136 (named San Anselmo). The original desk he used sits in the casita, with a copy of the Academy Award-winning script for guests to peruse. Apparently, he became superstitious about his stay in the desert and returned year after year to pen other equally regarded classics such as “You Can’t Take it With You” and “Mr. Smith Goes to Washington,” among others. All the rooms and suites (now numbering 640) at the resort and club are decorated with old world, Spanish hacienda-style furniture. On the other spectrum of famous guests-one casita is named the Eisenhower Villa. President Dwight D. Eisenhower came to visit friends at La Quinta while he was still in office, and played golf here. The first golf course in the Coachella Valley was built at La Quinta-a 9-hole course designed by golfer Norman Beth, at the cost of $50,000. Greens fees were $1, open to the public. There are 25 pools on the grounds of La Quinta named after famous guest, such as Dietrich and Garbo. (there are 25 on the grounds named after famous guests-Dietrich and Garbo were near my casita) and gurgling fountains. It is an extremely romantic place, however, families were seen at dinner and even at the health club, which was all right by me. There are so many activities here to keep everyone busy that I would consider bringing my children for a visit. Most romantic to me was the setting of the Plaza and the Plaza Bar, which is elevated above a courtyard filled with sections of flowering gardens and fountains, and surrounded by shops. A musical group called The Inka Kings played indigenous, melodic tunes, while guests either dined or just partook of beverages outdoors. The weather was perfect-in the mid- to high-70s in the day (in early February)-although a bit colder at night. I dined at the Adobe Grill, where I had a divine appetizer as a main course-a tamale pie made with layers of corn meal, sour cream, sauce and cheese. At 11 a.m., despite the fact several hundred guests were to check in and out that Sunday, I was taken on a tour of the Mountain golf course, one of five at the resort. I do not play golf, but the beauty of this course astounded me. The contrast between the green lushness of the course and the desert rocky mountains it abuts is amazing. stairs to the 16th tee. It gives a spectacular, complete view of the rest of the course, including the Dunes course and beyond. Later, I visited the Hacienda Grande in the northeast section of the resort where my casita is located, which is a suite with living and dining rooms, and with its own private pool in addition to a spa. He said actor Joe Pesci always angles to get this corner to himself. And, after all the kindness of the staff at La Quinta, I was even allowed a late check-out of 2 p.m., which gave me time to indulge in another dip in the spa, swim in the Dietrich pool, and to luxuriate in the sun. Ahhh yes, paradise it is.